LONDON, England (CNN) -- They helped introduce the world to mop top haircuts, collarless jackets and yellow submarines -- now a British university is launching what it says is the world's first ever masters degree in the Beatles. The masters degree will examine The Beatles' contribution to modern society. 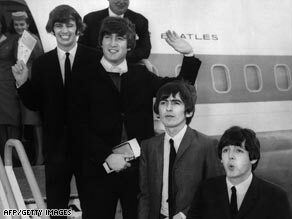 Liverpool Hope University, in the Fab Four's home city, says its Beatles, Popular Music and Society course will be a long-overdue examination of the band behind songs such as "Help!" "Lucy in the Sky with Diamonds," and "Octopus's Garden." "There have been over 8,000 books about The Beatles but there has never been serious academic study and that is what we are going to address," says Miles Brocken, Hope's senior lecturer in popular music. "Forty years on from their break-up, now is the right time and Liverpool is the right place to study The Beatles," he adds. He said the course, expected to offer places to 30 students when it starts in September 2009, had already received enquiries from overseas, including the United States. Brocken defended the course's practical use, telling the Guardian newspaper that academic study of John, Paul, George and Ringo would put its students firmly on the long and winding road to a successful career. What do you think? "I think any MA equips people with extra study and research skills. MAs of any description are vital for the workplace," he said. "You will find that once you have done a master's degree it separates you from the pack."